The Bank having both Mobile Banking and Internet Banking. The bank has give an Android Application for Smartphone user named as “PNB mBanking”. 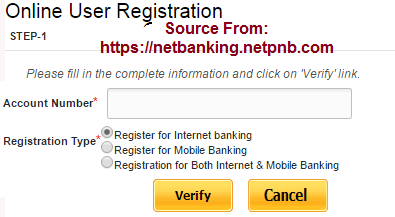 Who are registered in PNB Mobile Banking those customers must install the PNB mBanking App. Because it is easy to access your account statement or etc very easily. Using this facility customer would be able to register for PNB’s Internet Banking & Mobile Banking Services online without visiting branch. This facility is only available for who are self operated savings account and current account customers. Note: Candidates must registered your Valid Mobile Number within the Bank linked with your PNB Account and everyone must getting the SMS alerts from the bank. Click on “New User” link. Then Online User Registration form will be opened. Then Type your Unique Account Number and Select the Registration Type. I can prefer everyone must choose “Register for Both Internet Banking and Mobile Banking” facility. Click on Verify Button. If you given the correct details you can go to next step otherwise it can shows error message. In the next step you can get One Time Password to the Registered Mobile Number. Enter it. Click on Submit. After you can enter the debit card number and ATM Password. You can give the last transaction amount. Click on Next button. You can get another OTP SMS to your Mobile Number. Type it. In the next step you can choose your USER ID and Password. It will be activated within 24 hours.